First, my apologies, I know it’s been awhile. I got a little derailed with book events since February, but life has settled down now that the paperback is officially launched and the tour has wrapped up. Look for my June newsletter and giveaway very soon. 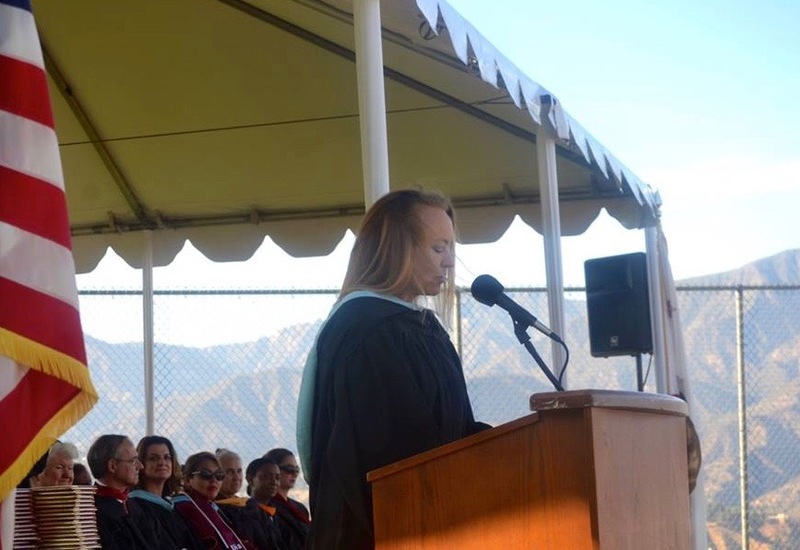 In the mean time, some folks have asked for a transcript of the speech I gave on Sunday at the 2016 commencement ceremonies for my high school alma mater, Flintridge Sacred Heart Academy, in Flintridge, California. It was 33 years to the day since I stood on that stage and gave the Valedictory address. What’s changed? I wasn’t standing in my gown having a hot flash on June 5, 1983, when I was seventeen. Thank you, Sister Katherine Jean, for that lovely introduction, and thank you Sister Celeste, Sister Carolyn, esteemed faculty, proud parents, and most of all, radiant graduates of the Flintridge class of 2016. What an incredible honor to be here today to recognize not only your achievements, but your supreme effort. You have challenged your intellects; you have invested in friendships that will last you a lifetime; you have been supported by the boundless love of your families and the brilliance and devotion of your teachers. In turn, each of you has blessed those gathered here in your honor with immeasurable, and particular, joy. We celebrate you. In four years of early morning swim practices, and at meets in which Coach Betsy Sauer invariably put me in the 500-meter freestyle event, I learned that if you just keep kicking, you will survive that horrific twenty laps and reach the end of the race, even if, without exception, the best you can do is finish last. I had learned that if you complete your Sunday shift working the front desk of the main building and find that you have tossed your retainer out with your lunch, you can retrieve it by diving vigorously in the dumpster out front, hoping none of your friends will see you. I knew from Katy Sadler’s phenomenal AP US History course that the story of our country fascinated me, and that I wanted to continue that study in college. From Sister Katherine Jean, I had learned that I loved language, and that literature was the finest way to immerse oneself in the imagination of others. And after four years in Marilyn Hobson’s classroom, I knew how to conjugate my French verbs. I knew that I had forged profound friendships, as you have, friendships that had sustained me in both joyful and difficult times. Through the Student Christian Action Movement, I had learned that service, like literature, was a gateway to empathy and compassion. And working on the ASB Board alongside five exceedingly competent peers, some of whom are here today, I knew that when it came to leadership, there was nothing a boy could do that we could not do better. Then I went off to college. Some of what I had learned, I remembered, and some of it, I forgot. You have been given many gifts here at Flintridge—but if you’re anything like me, you will not understand the full value of those gifts until you have misplaced them, then stumbled upon them again, as you walk through the journey we call life. That journey will not take a straight and easy path. It will include disappointments and despair. It will be marked by missteps, wrong turns, backtracking, stalling, and engine failures. What I have learned during my own journey over the three decades since I left this hill, and what I hope to share with you today, is that it is often the breakdown that leads to the breakthrough, it is the misstep that sets us on the right road, it is the interruption of our best-laid plans that clears the path to our destinies. After I left here when I was seventeen, I continued my study of French in college. My plan was to spend my junior year abroad, living in Paris with a French family, studying at the Sorbonne, speaking not a word of English, and, most importantly, drinking coffee in sidewalk cafés. But when at the end of my sophomore year, I interviewed for the Stanford-in-Paris program and members of the French faculty started firing questions at me, I panicked, forgot not only the conjugations Madame Hobson had drilled into us so diligently, but the entirety of my French vocabulary as well. I was not accepted into the Stanford-in-Paris program, and I was devastated. But I was also determined. So I saved some money, stopped out for a quarter, and went to Paris anyway. I found an apartment, took a few French classes, and indeed, sat in sidewalk cafés. I traveled the continent on weekends, read novels, and took notes. In January, instead of returning to college as planned, I moved to London, got a job in an office, read more novels, and took more notes. My journals from that year became the germ of a novel of my own that I would begin to write twenty years later. The seeds of the obsession with words and stories that would ultimately shape my life had been planted. But it was going to be awhile until I remembered to water those seeds, and when I graduated from Stanford two years later, I had lined up a job not in publishing or journalism, but in—of all things—investment banking. There is nothing wrong with investment banking, but there was everything wrong with it for me. I was a history major; I had not completed a math course since Algebra II here as a junior; I had dropped calculus, and gotten a “C” in financial accounting, the only “C” of my academic career. How had I persuaded Morgan Stanley to hire me as a financial analyst, and more critically, how had I persuaded myself Wall Street was where I belonged? Theodore Roosevelt once famously said that comparison is the thief of joy. That spring of my senior year, I had watched my Stanford classmates land high-paying jobs with tech companies, management consultants, and banks, and I had made a choice certain to make me miserable. I had forgotten what I knew so well, here at Flintridge, that a safer measure of success than money or prestige was integrity, faith in my own intuition, and pursuit of the truth of my own life. Yet I cashed my signing bonus from Morgan Stanley, bought four suits at Macy’s, and found a place to live in Manhattan. Then I stood by as my two roommates, who had cleverly avoided lining up gainful employment, decided to make excellent use of their Stanford degrees by moving to Hawaii, getting jobs as cocktail waitresses, then backpacking around the world. I was faced with an existential dilemma: Should I join them, or should I start the job? I did what I still do in a crisis, existential or otherwise: I called my mother. She listened to my predicament, and with the breathless conviction that can only be earned by having been a single mother who worked two jobs and made countless sacrifices to secure her three children’s futures, she said: “Take the trip.” And she promised to make my student loan payments for as long as I was away. She could not afford those loan payments, nor could she afford to send me to Flintridge, or Stanford, in the first place. Somehow, she had faith that it would all work out, and it did. Like my father’s faith in my ability to do anything I set my mind to, and like the unconditional love of your families, gathered here today, my mother’s quiet courage made my own path possible. I was away for two years, working in Hawaii and Australia, backpacking across Southeast Asia, trekking solo in the Himalayas, taking trains across India, job-hunting, unsuccessfully, in Hong Kong—and along the way, taking notes. I was often afraid I was wasting my time, but the left turn that sent me to Maui, instead of Manhattan, ultimately set me a step closer to becoming a writer. Still, it was going to take awhile. When I returned home, I had no car, no money, and no place to live, so after a few false starts, I found a job—no, not in publishing or journalism—but in a start-up that in the years before they so famously brought down the world’s financial system, made risk management software for the derivatives traders of commercial and investment banks. Finance—again. Shortly after I was hired, my boss, the VP of marketing, quit, and I took up where he left off, running the marketing department for five years, and helping to write the prospectus for our Initial Public Offering when I was eight months pregnant with my first child. How did I master the esoteric financial and software modelling behind our complex product? I didn’t. I faked it. And what I came to understand is that while it is often necessary to pay your rent or put food on the table, faking it, whether in work, art, or love, will in the long run starve your soul. My children were the happy interruption that drew me out of a career I might have stayed in indefinitely, even though it wasn’t my calling. After my second child was born, I quit to stay home and raise my kids and finally, to write. I was thirty-three when I signed up for my first writing class. A year later, I entered the MFA program at San Francisco State. I had two more kids. It took me seven years to earn a Masters in Fine Arts in Creative Writing, taking one class each semester. It took me five years to write and publish a first short story, inspired by my time in Australia. I revised that story at least one-hundred times, and before it finally found a home, it was rejected by twenty-seven literary journals. (But who’s counting?) Then it went on to win a prize that jumpstarted my writing career and that many years later, paved the way for the sale of my novel in just one day to Random House. But no award or recognition will immunize you against self-doubt, and I wondered: was the rejection I’d encountered the true measure of my talent, or the prize? The one-star, or the five-star reviews? The quick sale to a publisher, or the initially sluggish hardcover sales? The answer, I have learned, is neither. Life is not like swimming the 500-meter freestyle. It is not a time to beat or a race to win or a medal to hang around your neck. In life, a better goal than winning is to keep swimming with an open heart and an open mind toward your own truth. There is a vitality, a life force, a quickening that is translated through you into action, and there is only one of you in all time. This expression is unique, and if you block it, it will never exist through any other medium; and it will be lost. The world will not have it. Life is fragile, use it roughly. Wrest from it all you can. Love in it what you’ve got . . . Because death, it turns out, does not respect our plans for personal improvement. It does not rank us as human beings or decide who’s deserving of its favors and who isn’t . . . Graduates, you have used life roughly, here on this hill, and I know you will continue to do so as you go forth to forget, and then remember, all that you have learned here at Flintridge, and to build beautiful lives of faith, integrity and truth. Congratulations, and God Bless You. [ii] From “Sudden Death of a Father Just When He Was at the Bring of New Life,” by Cristina Nehring, Slate, February, 2013.